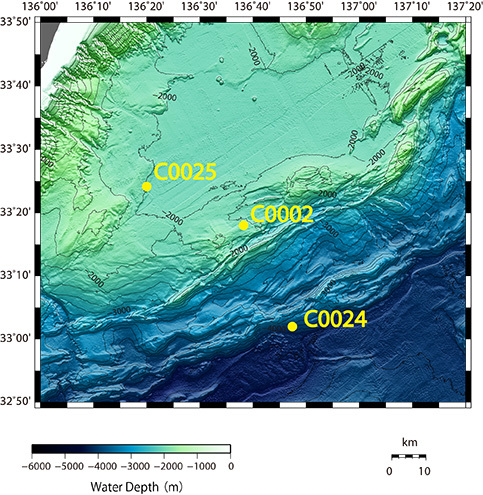 The Japan Agency for Marine-Earth Science and Technology (JAMSTEC: Asahiko Taira, President) aboard the Deep-sea Scientific Drilling Vessel Chikyu has been conducting IODP Expedition 358, “NanTroSEIZE Plate Boundary Deep Riser 4: Nankai seismogenic/slow slip megathrust” since October 7, 2018 (reported September 27, 2018). Chikyu will enter the port of Shimizu and end the Expedition on March 31, 2019. This Expedition attempted to deepen a riser hole at Site C0002 in the Kumano Basin, to access the plate boundary fault at likely seismogenic depths and the overlying high-velocity zone which was considered to store strain energy, for the first time anywhere. Having ended drilling at Site C0002 at a shallower depth than the intended target (reported March 1, 2019), Chikyu moved from this site on March 3, 2019 to carry out contingency plans which complement and reinforce scientific results from previous NanTroSEIZE expeditions at two other sites in the Nankai Trough; Site C0024 (proposed site name: NT1-03C) in the toe region of the Nankai Trough and Site C0025 (proposed site name: KB-01C) at the northern margin of the Kumano Basin (Figure 1). At Site C0002, this Expedition reached 3,262.5 meters below sea floor (mbsf) (1,939 m water depth) a new depth record in scientific ocean drilling while collecting logging while drilling (LWD) data and sampling drill cuttings (Photo1, 2, 3). Furthermore, core samples of 2.5 meters in total length were recovered from 2,836.5 to 2,848.5 mbsf, also a new depth record in scientific ocean coring (Photo 4). Research using the data and samples collected by this Expedition will provide new insights into seismogenesis in the Nankai Trough area. As for the contingency Site C0024, Chikyu drilled through the frontal portion of the plate boundary fault and acquired LWD data down to 869 mbsf. Core samples of 247.7 meters in total length were recovered from the upper plate (down to 247.7 mbsf), and of 52 meters in total length from deeper depth of 510 – 621.5 mbsf. Studying the properties at and above the frontal portion of the plate boundary fault is expected to contribute to the understanding of relationship between mega-earthquakes having fast slip and slow earthquakes. At Site C0025, core samples of 123 meters in total length were recovered from 400 to 580.5 mbsf . Analyzing the formation history of the Nankai Trough accretionary prism using the collected core samples will elucidate the formation and evolution processes of the Nankai seismogenic zone. Integration of the research using data and samples acquired by this Expedition and scientific results achieved by NanTroSEIZE thus far will enable promotion of the worlds most advanced and unique ocean drilling science on seismogenic zone. Q 1,939 m 3,262.5 m 2,887.5 - 3,262.5 m Reached a new depth record in scientific ocean drilling. Acquired LWD data and drill cuttings. T 1,939 m 2,848.5 m 2,836.5 - 2,848.5 m Collected 3 core samples of 2.5 meters in total length from record depth in scientific ocean coring. A 3841.5 m 869 m 0 - 869 m Crossed the frontal portion of the plate boundary fault using LWD. 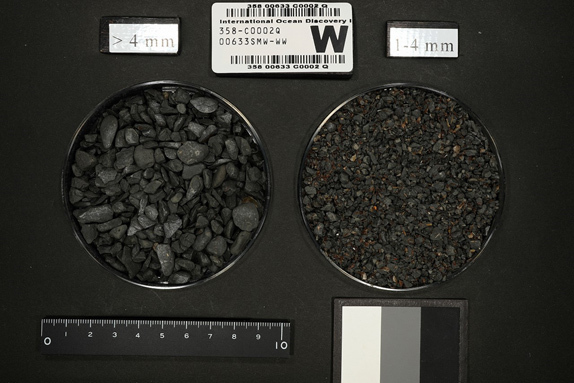 B,C,D 3843.5 m 128 m 0 - 128 m Collected 16 core samples of 107 meters in total length from the frontal portion of the upper plate. G 3843.0 m 319.5 m 100 - 319.5 m Collected 24 core samples of 140.7 meters in total length from the frontal portion of the upper plate. E 3843.5 m 621.5 m 510 - 621.5 m Collected 12 core samples of 51.5 meters in total length from deeper depth. A 2011 m 580.5 m 400 - 580.5 m Collected 19 core samples of 123 meters in total length.